American cartoonist born in Steubenville, Ohio, on February 10, 1892. Dorman Smith was educated in the public schools of Columbus, Ohio, and secured his first job. in a steel mill, at the age of 20. After taking the Landon correspondence course in cartooning, he got his first artistic job drawing ads for the Jeffrey Manufacturing Company in Columbus (1917 – 1919). 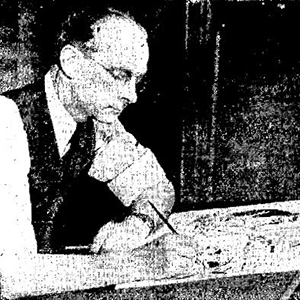 Smith became an editorial cartoonist for the Des Moines News in 1919 and in only two years moved to Cleveland, where he became chief editorial cartoonist for the Newspaper Enterprise Association – and immediately thereby one of the most widely distributed of his profession in America. In 1927 he switched to the Hearst papers and drew for outlets in New York, Chicago and San Francisco until 1941, when he returned to NEA. He remained there, alternating with the young John Fischetti during the last years of his career, until his death on March 1, 1956. Smith is remembered for the exuberence of his cartoons; he drew on a very large scale and filled his drawings with enormous doses of animation, excitement, action, sound effects and labels. In this regard he was happily old-fashioned, and his cartoons presented strong opinions lucidly, unencumbered by crowded panels and busy crosshatch shading. Smith won awards for his watercolors as well as for his cartoons. His books were largely instructional in nature and include 101 Cartoons, Cartooning (a course) and First Steps to a Cartoon Career.